All afternoon, unaware of the falling, drifting snow, Simplia had been pivoting her head first one way, then the other, attentive to the volley of opinion and observation put forth by the Magical Friends hunkered around the fireplace at the Fairy Tale Lobby. Their conversation was peppered with lively examples of how, yes indeed they had altered traditional stories to suit themselves or to better suit their audiences. Depends on the audience. A lot of psychologists say that kids need closure, and until it is sure the villain will never ever come back (is dead), they will feel anxiety after the story ends. They also say that kids don’t imagine or process the villain dying as adults do (they don’t imagine the gore or the reality of it, just like with Little Red being devoured). … With that said, I can see where you are coming from and I am struggling with this too. 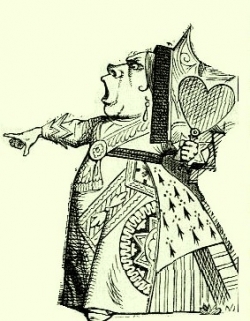 In Hungarian folktales there are endings that say “the wicked queen was so angry that her plan failed that she dropped dead.” (or popped like a balloon, which kids find endlessly funny). …Ultimately it’s up to the storyteller, and depends on the audience :) Closure is the important thing. So, a wise young one in the front row, upon hearing that the ‘witch’ was never seen again cried out, “She was really gone, wasn’t she?” Yes, indeed she was. …(A)ll that psychological research was borne out in one child’s triumphant realization that the story evil was truly vanquished. Death in such stories is symbolic. And symbols work wonders. When I was about 10 years old, I went with my parents to see a production of Macbeth which turned out to be particularly gruesome. But not long into the play, I suddenly realised I knew the story. I’d been told a fairly mild version of it by my teacher. Knowing what was happening next made it safe for me to watch the play without getting too scared. The first time I read “The Vicious Fairies” in Eddie Lenihan’s “Meeting the Other Crowd” (a traditional Irish tale), I was appalled. In it, the Fair Folk are told that on the Day of Judgment, they will only see the face of God if one drop of blood can be found in their veins. But they have no blood, as such; they are cursed forever, not for their actions but for their identity, for what they are, not who they are. I couldn’t accept that this was considered a “Christian” story; it wasn’t the way I was raised to understand the religion. So I wrote a new ending–the human, realizing what he thought was good news was really a curse, cuts his own hand and offers it “blood brother” style–offering that ‘drop of blood’ as he feels Jesus would. And yes, I tell my listeners what I changed and why. …they have heard an original twist on an old tale. I hope that satisfied both the traditionalist and Muse. I like your new version :-) Some say that the intermarriage of fairy and human was also an attempt to put our blood in their veins as well as vice versa. Fairy tales are magical. As in all magic, there is sleight of hand. How do we handle these tales? Unlike magicians, who pull rabbits out of hats, we storytellers take our listeners and ourselves down the rabbit hole. What changes we make to the story during our decent, we make at our peril. We are messing with magic. My impulse is to say, “Don’t change the story,” but when I take the story in hand, it morphs in front of my eyes. The words on the pages of collected stories may be static, but the images they create shift and change every time I read them. Bear with me my illusion that the tales ask me to change them. The tales cannot live in the words spoken and recorded in the past, but must be revived, given new breath to survive.